FactSet’s Revere Business Industry Classification System (RBICS) with Tradenames represents a company’s participation in a given RBICS Sector by capturing: company name, subsidiaries, business segments/units/divisions, products/service categories, brands and product/service names. FactSet’s Revere Business Industry Classification System (RBICS) with Tradenames represents a company’s participation in a given RBICS Sector by capturing a combination of the following: company name, subsidiaries, business segments/units/divisions, products/service categories, brands and product/service names. The result is a comprehensive multi-sector representation of companies’ businesses, which enables product-level competitive analysis and unprecedented elucidation of peer groups and the market landscape. The product information and content statistics contained in this document are as of August 2018. Create a robust framework for NLP-based analysis by integrating unstructured or alternative content associated with a product, service or brand. Delve beyond simplistic company-level peer groups to reveal product-level competitors. Seamlessly integrate content from alternative data sources through the linkages between tradenames and FactSet’s company identifiers. 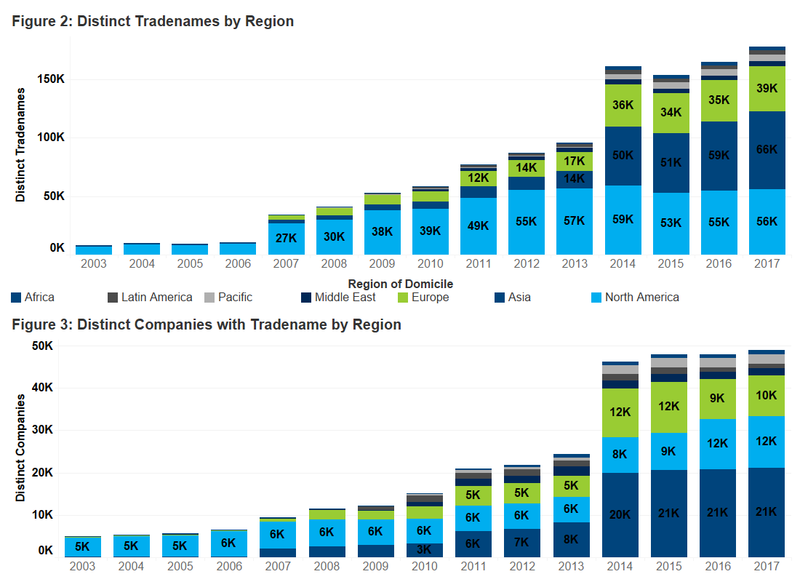 FactSet’s RBICS with Tradenames offers a database of 170,000+ tradenames for 49,000 global companies, all of which are mapped to the RBICS taxonomy. Coverage selection and expansion are prioritized based on global index inclusion, liquidity, market value, and asset size, among other factors. Figure 1 highlights overall coverage for tradenames and companies, while Figures 2 and 3 showcase regional coverage over time. RBICS with Tradenames offers an extensive database that tracks the relationships between companies’ tradenames through time. These relationships facilitate the extension of traditional security masters to include business lines and products, thereby supporting analysis beyond traditional security-based data sets. FactSet maintains the RBICS with Tradenames database through a rigorous, analyst-driven process. Analyst teams, specialized by industry vertical, review primary source documents (e.g. annual reports/filings, investor presentations, company websites) to catalogue and map companies’ material product and service offerings to the most suitable RBICS sub-industry. FactSet conducts full profile reviews at least annually based on the filings cycle. The combination of RBICS with Revenue and RBICS with Tradenames enables the systematic creation of peer groups at a more granular level than what has been traditionally possible with standard industry classifications. 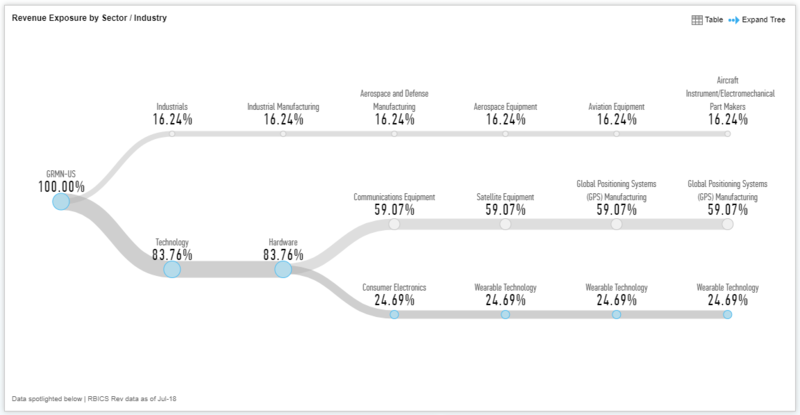 For example, comparing Garmin and Fitbit, we can see that Fitbit is fully concentrated within the “Wearable Technology” sub-industry while Garmin derives just 24.69% of its revenue from this area. This demonstrates how the inclusion of revenue alongside a standardized classification system can provide greater insight into a portfolio and highlight ancillary exposures to a given industry. While Fitbit and Garmin’s products are widely known, the key benefit of Tradenames is that it facilitates a programmatic approach to connecting products to companies and companies to peers. Extending beyond operating segments, Tradenames allows for comparisons at a more granular level. 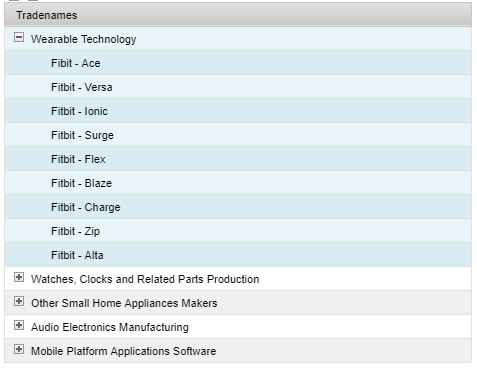 Shown below is the list of wearable technology product names associated with Fitbit. Within the Tradenames DataFeed, each product below is linked to a permanent FactSet Product and Trade ID, which are mapped to both the company and the appropriate RBICS Subindustries. By capturing and classifying business lines, revenue and products, Tradenames provides a symbology framework for more precise peer analysis and the analysis of data sets beyond the security level. Today’s analysts, be they quantitative or fundamental, are presented with endless amounts of data that can deliver insights never before possible. Whether it be geo-location, consumer credit card transactions, or social media sentiment, these new data sets offer timelier context to a company’s operations. When evaluating geo-location or credit card data, it is critical to understand the relationship of a store, a product, or a brand to a tradeable asset over time. Or when analyzing social media data, accuracy is heavily influenced by the ability to identify the relationship of text to a company. Tradenames provides a framework to associate these types of data back to a company or security. A simple but powerful application of this framework is to evaluate the sentiment of Fitbit’s Tradenames on recent earnings call transcripts. Identifying which Tradenames are or are not mentioned by management and analysts can provide key insights into their relevance to the market. Additionally, the extensive research surrounding the importance of language that is used on earnings calls can be applied at a more granular level to understand general sentiment or identify trends. 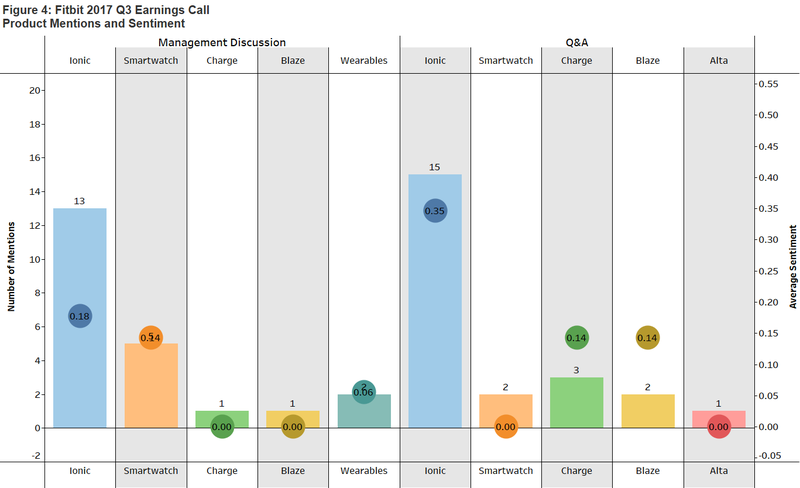 Figure 4 represents Fitbit’s third quarter earnings call and the associated mentions and sentiment for several products: Ionic (the company’s first smartwatch), Charge, Flex, Blaze, and the generic term smartwatch. 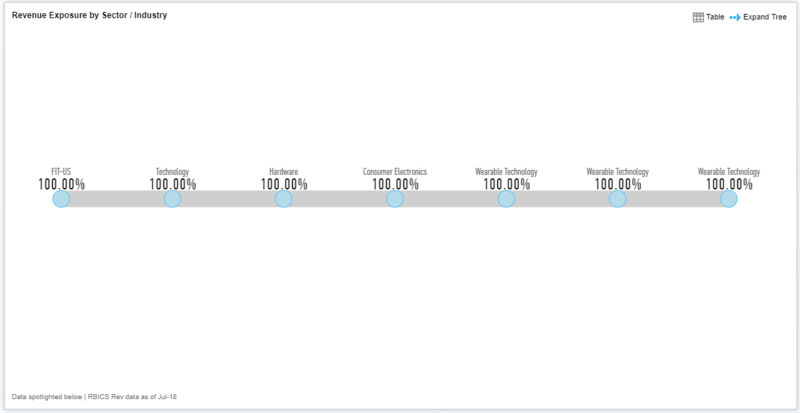 The Ionic was the most frequently mentioned product (13 times in Management Discussion and 15 in Q&A) and had the highest average sentiment (.18 in Management Discussion and .35 in Q&A). With the holiday season and Black Friday around the corner from this call, one assumption that can be drawn is that the company was counting on the Ionic’s success over that period. Product sales, however, would have been dependent on competition given the many choices in the wearables space. To identify individual competitors based on business lines and products, the RBICS sub-industry classification for the Ionic, Wearable Technology can be used, allowing users to compare the product to key rivals: the Apple Watch and Apple Watch Nike+. Web searches and traffic can serve as a proxy for consumer demand. The Google Trends API provides an index value that captures the search volume for a term or set of terms. Evaluating Tradenames within this context, the consumer appetite for Fitbit vs. Apple’s wearables can be seen. Figure 5 shows the search volume for these products between November 5, 2016 and November 25, 2017. 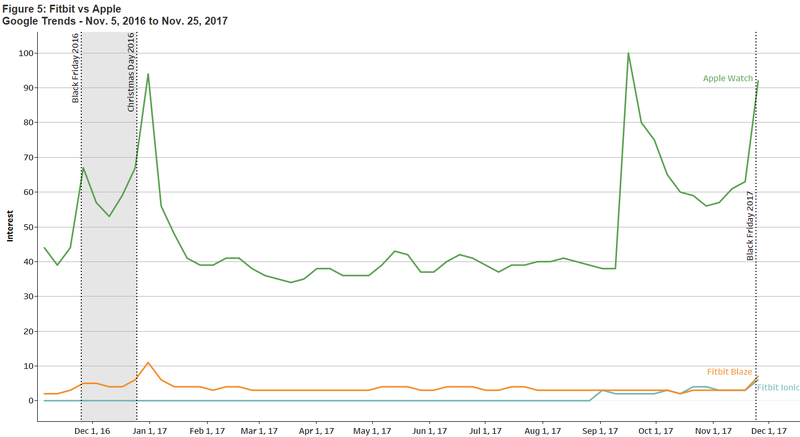 Based on search volume, the popularity of the Apple Watch continued to outpace both Fitbit’s Ionic and Blaze products with the introduction of a new Apple Watch and reduced prices on previous versions in September 2017. This single product competition could have an outsized impact on Fitbit’s performance, especially given Ionic’s importance to Fitbit as indicated during the earnings call. Identifying Fitbit’s reliance on Ionic as well as the product’s performance vs. key competitors showcases the importance of identifying relationships at a deeper level than a simple company vs. company or broad industry approach. Data-driven decisions are not new to the financial industry; quants have used data science well before there was a phrase or role for it. What has changed is the abundance of data and ideas that can be explored, which in turn has intensified the importance of a multifaceted symbology layer that can identify connections across many dimensions. The ability to understand a business, product, and competition within a standardized framework enables seamless integration of unstructured and alternative data. Incorporating alternative data sets is quickly becoming a necessity, but in order to capitalize and do so at speed you need a robust and interconnected symbology layer as the foundation, which is exactly what the FactSet RBICS with Tradenames DataFeed provides. For more information, please visit the product page on the Open:FactSet Marketplace. If you have any questions or would like to start a trial, please contact us at OFSupport@factset.com.